One a scale of one to the guy with the painted face, how hype are you? We all know that one kid, the one who shows up to any sporting event (football, baseball, chess, etc.) dressed head-to-toe in school colors. This includes, but is not limited to, face paint, a jersey, and signed apparel. They yell at the refs, give advice to the coaches, and motivate the players as if they are best buds. These fans are hard to miss. You may also catch sight of these excited sports fanatics around campus, still decked out in school apparel and full of opinions on every game ever - past, present, and future. It is natural for parents to get excited about their child's college. They want to be encouraging of their child's choice and motivate them to enjoy their years of higher education as much as possible. If not careful though, it is easy for these parents to live vicariously through the students around them at the game, cheering and doing the school's chants. No matter what the case, they will always have a smile on their face and love for the team they have grown to love. 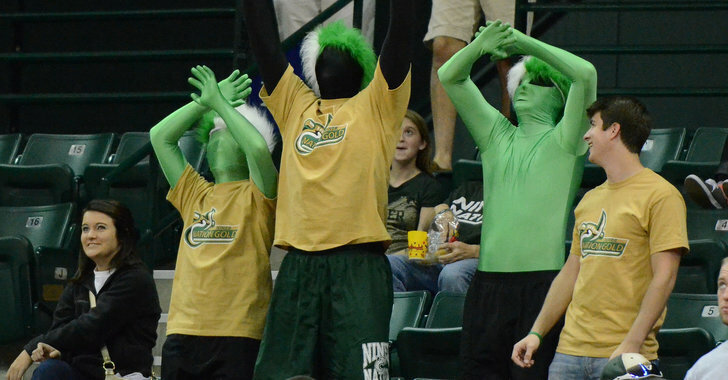 As the daughter of two proud Charlotte forty-niners, I feel I know a thing or two about the average college alumnus. For starters, their school spirit has only amplified since they received their degree. They stand up for every minor accomplishment of the team, cheer for each and every player, and if you think they will hesitate to yell the old school chants while standing next to their eighteen-year-old daughter, then you are quite mistaken. Watching kids in their natural habitats is absolutely fascinating, especially when that environment is a huge arena. From the mascot to the floppy chairs, everything is new and exciting! What should keep them from hopping up and down the stairs or hiding behind their parents' seats? Do you get a little excited when the "shake cam" sign is displayed on the jumbotron? Have you ever done the floss with hopes of grabbing the camera's attention? Have you ever been caught jumping up and down when you realized you were being watched by the entire arena on the biggest screen in a five-mile radius? If this is the case, you are likely a jumbotron hog, and we would appreciate it if you could quit dabbing and calm down for a few minutes. I actually like watching basketball, and I have no doubt I am one of the numerous ladies who do as well. Even so, college girlfriends do not always have the best attitudes when I see them at basketball games next to their boyfriends. More than once, I have seen a girl make her boo leave the game early, if not ditching him altogether to hang out with her friends. After all, once you get the perfect Insta post, who cares how the game goes? In the case where a guy decides to attend a game with "the guys," the girlfriend is still present. Just a week ago, the guy in front of me at a game received a series of lengthy texts from his girl listing out some of the present problems within their relationship. The poor guy tried to fix things over a few texts, but he ended up essentially leaving the game in the middle of the second half to patch things up. The school spirit of a newly-accepted future college student is almost equivalent to that of an alumnus. They are ready to be in the student section, referring the school as "home" and wearing nothing but school colors for the next four years. In my short time in college, I have quickly realized this is not the case, but I just can't bring myself to break the spirit of these high schoolers. Never stop dreaming, future college kids! You know that period of time after the first half of the game when everyone leaves their seats? You always think, "Oh, they are just grabbing a snack during half-time," then half-time is over and the seats are still empty... You abandoners are fake fans. I see you look both ways before grabbing your things and leaving before the game is finished. It's wrong and I will judge you. Maybe you have seen some of these characters. Maybe you haven't. Maybe you have never even set foot inside a college basketball arena. Good news for you: the season is not over yet! Take advantage of your free tickets and hopefully catch sight of the people above!